In most cases of so-called “normal breathing”, the breathing action is concentrated in the upper part of the chest. There is no conscious attempt to use the diaphragm in drawing more air into the lungs. Shallow breathing gives inadequate scope for the inhaled oxygen to permeate and recharge the venous blood. Lying down comfortably, raise the legs by placing a cushion underneath them, and rest your hands, finger tips touching, into the hollow section below the rib cage. Breathing through the nostrils, inhale steadily, first filling the lower part of the lungs. This is accomplished by bringing into play the diaphragm, which, by ascending, exerts a gentle pressure on the abdominal organs, pushing forward the front walls of the abdomen. You will experience it as the finger tips part slightly and the abdomen becomes “dome shaped”. The wave of expansion now spreads upwards to embrace the chest as the intercostal muscles contract and the rib cage expands right around the front, sides and back, filling the middle part of the lungs. Lastly, the higher portion of the lungs, are filled by the expansion of the upper chest or clavicular area. Here you will feel the shoulders pushing back gently, towards the floor. In this final movement, the lower part of the abdomen is drawn in. Retain the breath for a few seconds. Exhale slowly, holding the chest in a firm position and drawing in the abdomen slightly, lifting it upwards, as the air leaves the lungs, and the chest area starts to relax. It may appear that this breath consists of three distinct movements. This, however, in not correct – the inhalation is continuous, resembling a “wave-like” action. Practise will soon overcome the tendency to divide the breath into three jerky movements. Try and concentrate on deep, slow breathing. In yoga, we concentrate on exercises which open and expand the chest cavity, encouraging greater intake of oxygen and the ability to retain the breath. Here all four phases of breathing namely: inhalation, retention of breath, exhalation and retention of exhalation are included in a rhythmic form. Breathing in rhythmic formations will help you to concentrate and gain control of the breath and hence, control of the mind. Very few of us pay five minutes attention to our breathing unless illness or some emergency gives it prominence. In this way, we can learn from the ancient yogis who taught that “one who controls breath, controls life itself”. 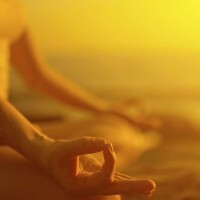 This entry was posted in Articles, Asanas. Bookmark the permalink.